HockeyPucks hiking and highpointing: Vose Spur - 3862 Ft.
From route 302 turn on to Sawyer River road (gated in winter) and follow the gravel road 2.0 miles to the Signal Ridge trailhead. There is a large parking lot on the left side of the road. The trail head is across the street. 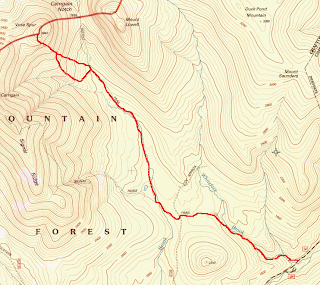 DESCRIPTION: From parking on Sawyer River road cross the street to the trailhead. The Signal Ridge trail enters the woods and soon crosses a stream from a col on Mt. Saunders and a few feet later crosses Whiteface brook. The Signal Ridge trail ascends moderately over an easy grade paralleling Whiteface Brook on your right. After approximately 1 mile the trail branches left and ascends to a saddle with a easy grade. The trail levels, then declines slightly as it appears to follow a former railroad grade over very easy footing to Carrigan Brook. 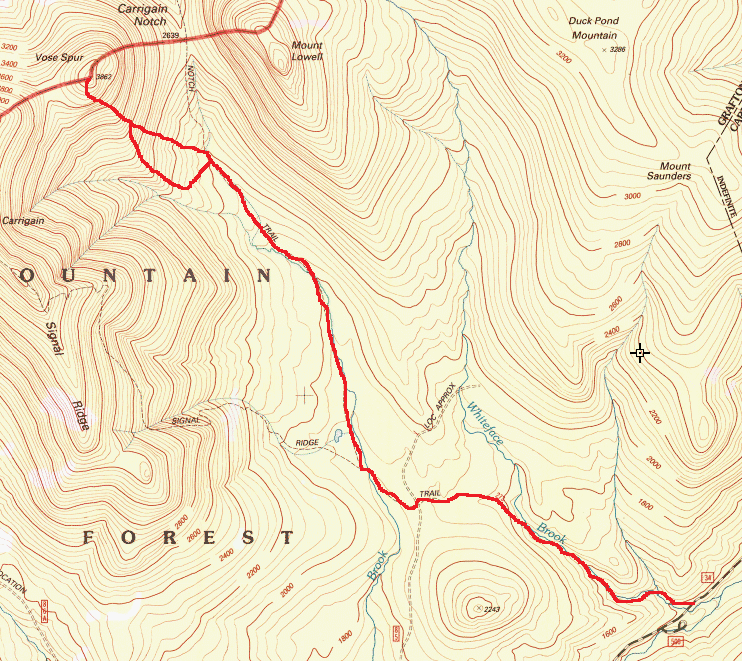 After crossing the brook the Carrigan Notch trail junction is a short distance away. Follow the Carrigan Notch trial over relatively flat terrain as it crosses and re-crosses Carrigan Brook several times. At approximately 1.5 miles of the Carrigan Notch trail you encounter a medium sized boulder on the left. My eye ball measurements guess it's about 4.5 foot tall and 4.5 feet diameter and can be easily missed. From the boulder pick a clear opening and begin the bushwhack. The bushwhack is complex requiring a start in a southwest direction to a ridgeline then changing direction to a northwest bearing. During my ascent I made a minor error in direction and headed straight northwest causing me to end up ascending a steep drainage to a very steep slope with some very large boulders. Once clearing the boulders I hit some very thick spruce before finally finding a herd path at the base of the talus slope. The talus slope was steep however I was glad to find a path and be out of the previous unpleasant terrain. The talus slope provides the best views on this hike. Stay to the left of the talus slope and continue along the herd path through fir waves another 0.2 miles to the Vose Spur summit. There is a register mounted to a tree at the highest point. I found no other official markings. Vose Spur is named after George Vose (1831-1910) a US Civil Engineer and educator in the field of railroads. I assume Mr. Vose performed some railroad surveying in the Mt. Carrigan and Vose Spur region which caused the peak to earn his namesake. Vose Spur is ranked 56 of the highest peaks in New Hampshire and listed 79 on the 100 Highest Peaks in New England AMC hiking list. The boulder marking the start of the Vose Spur bushwhack can easily be missed. It's not an obvious landmark and you question if this is the correct boulder when spotted. A sign marking the trail junction with the Carrigan Notch trail and Signal Ridge Trail. Signal Ridge and Mt. Carrigan from the Vose Spur talus field.